I've been seeing this technique all over the 'net so was delighted when a friend's class (thank you. Lesley!) focused on this technique. 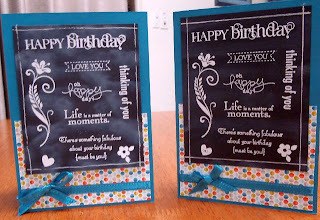 Here are a couple of cards we produced at Lesley's class. She had set up the stamps on a large acrylic block first. 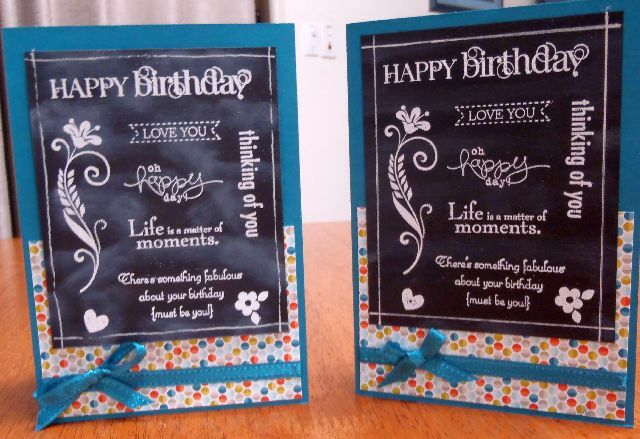 We used our embossing buddies to swipe the black cardstock first and give it a 'just erased chalkboard' feel. Then we stamped and embossed in white. I drew lines around my image in white gel pen, then we mounted the image on Stampin' Dimensionals, on Island Indigo cardstock and Sycamore Street designer paper, before tying a bow in Island Indigo ribbon. Cute, cute, cute!